All the stuff you need for when your child comes into the world. The free What to Have While You’re Expecting document is a template that tells you what you’re going to need when you have a child. People have been bearing children for quite some time but it wasn’t until very recently that companies came up with neat products that make the whole process much easier. These are the perfect items you should consider adding to your baby shower registry. 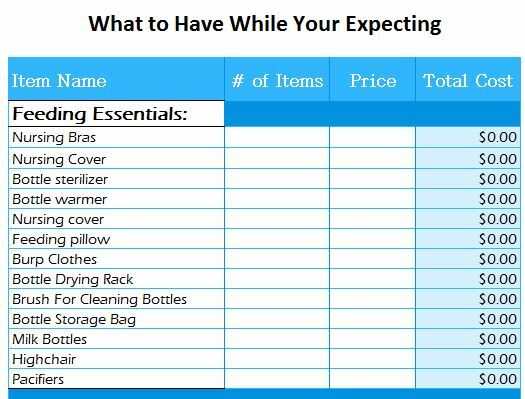 You will receive a helpful list and a calculator that lets you add up all the items you want. You’ll see that these items can get pretty pricey, that’s why we recommend adding them to the registry. The items that we have compiled for you will be displayed in the first column of the template. We have also taken the liberty of breaking down the different categories into so you can see shop for all your items in one convenient trip. You will also see a calculator to the far right of the template. When you shop around, you can enter the prices of each item displayed and totals them at the bottom of this page. You can also see the grand total at the top. If you want to change any of the items or simply add to the list, you would simply click the cell you want to change and type your new item. This template is a fast and convenient way to start shopping for your baby and items that will make raising your baby much easier.